I promised an update on my garden, so since I will have my wonderful grandson tomorrow I thought I better get this done tonight. As you can see from the photo above it is coming along just fine. Look closely at the mustard. I do believe we will be eating some in the next couple of weeks. What do you think? I can hardly wait. I absolutely love reaping the result of my hard work. 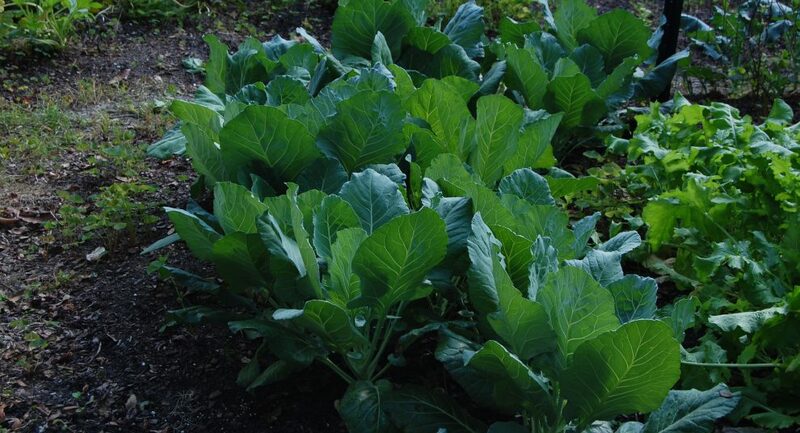 Like collards mustard greens is an acquired taste either you will or will not like them. Remember I told you about planting the radishes, beets and carrots last week? Well most of the tiny plants are peeping out of the soil. You can see the radishes but the other two will need a little longer before they will be easily seen in a photograph. If you are wondering about the straw it is hay; part of the compost from my chicken pen. My chickens pay for their keep in more ways than one. It’s a good thing I get compost because right now most of them are molting and I’m only getting one egg a day. I know the egg comes from Amera because it is blue and she is the only one that lays blue eggs. And another factor that figures in to the “no egg production” is the shorter days. They don’t lay as much when they have less sunshine. However, we should change time soon; fall back, so we will be eating eggs again. Thank you for stopping by. I will keep you updated on the garden. I’m so happy it is doing well. God truly blesses me. Until next time happy gardening and God bless. This entry was posted in blog, blogging, Daily post, Florida, gardening, God, nature, photos, southern, Uncategorized, vegetables, weekly photo challenge. Bookmark the permalink. Congratulations grandma! I also love reaping the rewards from the garden it’s hard work sometimes but when it pays off it’s worth it! Not your grandma but thank you. I’m sorry I meant because you mentioned you were having your grandson I thought he was new I misread. I apologise. I’m sorry Genevieve, I’m a little, ok a lot, slow on the take up. I apologize. Thank you for your comment. My grandson is seven and such a joy. We thought we would never have grandchildren and then he was born. What a wonderful gift from God. Have a blessed day. Looks as though you have a productive veggie patch. How big is your garden? Not very big. I have two 8×4 raised beds, an old wading pool and a few containers. Hopefully in the spring I will add two more raised beds. I love gardening. It is great to travel also but we don’t go that much. I too have my herbs and of course peppers. Once gardening gets in your blood it is hard to quit. My Daddy was a farmer in Georgia when I was a little girl. I guess I caught the garden fever from him. I also grow flowers; guess I’m a plant collector.